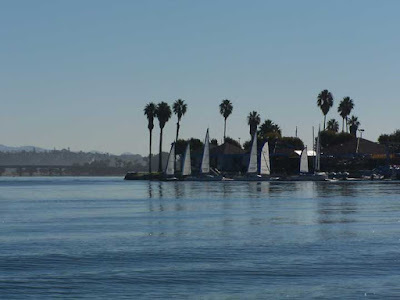 San Diego, California is one of the most beautiful cities in the world, in the very best climate that planet earth has. That climate, by the way, is shared with places like the Mediterranean Riviera, which is between 30 and 40 degrees latitude. This Mediterranean climate is never too hot or too cold. Its position on planet earth, along with the tempering effects of either the Pacific Ocean or the Mediterranean sea (as the case may be) creates some of the most delightful weather in the world, summer and winter alike. Conversely, Phoenix Arizona, although it's at about the same latitude, gets hot in the summer. Really hot. Terribly, uncomfortably, horribly hot. And the people who live there, if they can, have always tried to get out of there for the summer, their first choice being San Diego. Being an old Angelino myself, I know nothing about San Diego. To me, Los Angeles seems to be the closest place to go sit on a beach, but it's not, San Diego is. And not only has San Diego been more accessible to Phoenicians for over 100 years, the city welcomes them. Yeah, the residents call them "Zonies", which isn't very nice, but overall the city of San Diego makes things comfortable and inviting to people from Arizona. Now don't get me wrong. Los Angeles, and especially Santa Barbara, are great places. And that's where I go, when I can, especially as I have friends there, and I know my way around. But Los Angeles has never been as successful as San Diego in attracting people from Arizona. I'm an old desert rat, so I'll be spending another summer here. And yeah, I like the fact that Phoenix gets less crowded, and that you never have to wait in line at a gas pump, and that the prices are much lower. But if you're going to San Diego, I'll admit it, I'm jealous. 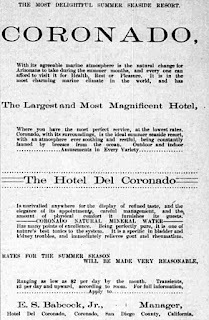 Image above: Ad for the Coronado Hotel, San Diego. The Most Delightful Summer Seaside Resort. 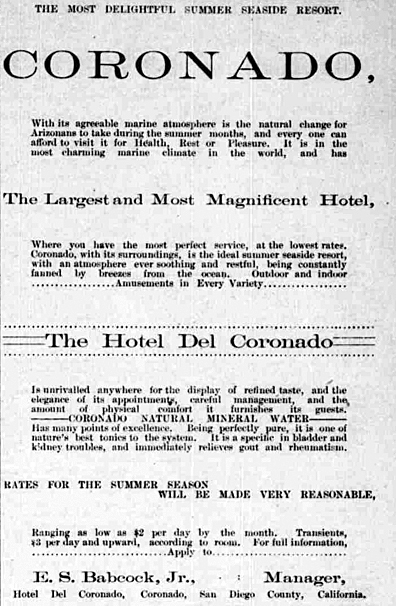 This ad ran in the Phoenix newspaper in 1890.